Flowers are a part of almost every beautiful landscape and have inspired humans to see the beauty in nature through the ages. From famous poets and artists to the lady next door, flowers play an important part in our lives. Not only do they improve the aesthetics of our surroundings, but are the reproductive organs of a plant and help it to pollinate and spread. Producing most of our food supply would have been impossible without the help of flowers. Though most of us imagine flowers in a bright, sunny surrounding, there are some beautiful flowers that fully bloom only in the dead of the night and that does not reduce their beauty in any way. Here is a list of the ten most beautiful night blooming flowers. This plant is also called the Night Blooming Cereus and as the name suggests, is a member of the cactus family. It is found mostly in the deserts of Mexico and Arizona and blooms only for a single night each year. The flowering usually occurs between June and July each year and after the night it blooms slowly wilts away and dies. It has a pleasant fragrance that deepens as it blooms. It has hundreds of pollen sacs inside the flower and is pollinated by moths or bats depending on the species of the flower. One of the most beautiful nights blooming flowers. 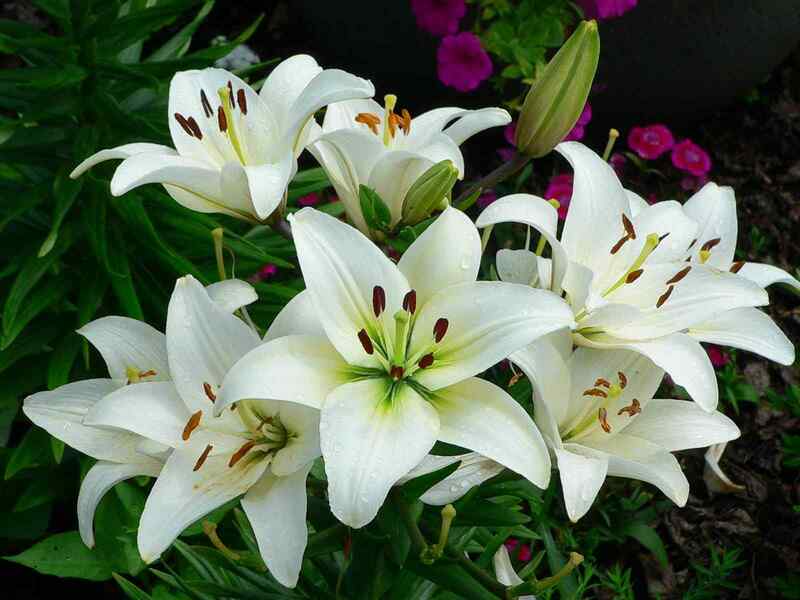 It comes with large white coloured flowers that can bloom upto 12 to 17 centimetres mostly during summer. The flower usually opens up in the evening and typically last until dawn. The plant can produce many flowers over a season and have a sweet and strong smelling fragrance. The new plants can be easily planted by just cutting the stem of the old soil and plant it in the soil. The flowers of the Dragon Fruit are known for their large white petals and dark green leaves that make the fully bloomed flowers look stark white against the dark background. These fruits and flowers are native to Mexico and Central America but are now widely cultivated in China, Malaysia, Vietnam and Taiwan. The flowering period is between October and May. Once the dragon fruit flower has been bloomed, the flower dies to allow for the fruit to develop. The fruit plant will develop approximately seven “flushes” of buds on its stems during one season. These buds are most often cooked before consuming it and have a cactus-like taste. The flavour is also likened to that of asparagus. You can also read about beautiful and rarest flowers in the world. The night blooming Brahma Kamal, scientifically known as Saussurea obvallata is found in the Himalayas in India, Myanmar and China. It is a purple bud that blossoms into a white flower. It is named after the Hindu god Brahma and is an important part of religious rituals of some Himalayan communities. The name of the flower can be translated into “the lotus of Bramha”. Lord Brahma (creator of the universe) has always been projected sitting on a huge lotus and holding one of the night blooming flowers in his hand. Additionally known as kanja meaning born out of the water. There was a story related to one of the beautiful flowers i.e when Shiva attached the head of the elephant on Lord Ganesha body, later he has taken bath from the water sprinkled from the Brahma Kamal. This is the primary reason it has been given the status of a live restoring flower of the gods. The 4 O’ Clock flower is named after the time of its bloom – i.e. in the evening. It stays open till early morning, after which it closes. The scientific name of this flower is Mirabilis jalapa and it has many different colours like red, pink, white, blue and yellow. It blooms in the spring and has a very pleasant smell. It is extremely popular as a garden plant because of its fragrance and varied colours. It is considered one of the most beautiful night blooming flowers. The flower can be grown with the help of large seeds that makes quite easy to plant it and germination process initiates fast and the plant can grow upto 2-4 feet. You need to keep the seedbed moderately moist during germination. The flower prefers full sun, however, partial shade will also be ok. To initiate a vigorous growth, add fertilizer once or twice a month. The common problem includes Insect and diseases, however, if the problem persists treat early with organic or chemical insect repellents and fungicide. This flower gets its name from where it was first discovered – in the Nottingham Palace in England. The night blooming flower is usually yellowish-white in colour and is found on rocky hills in England. This flower blossoms in June and July and has five petals and a hairy stem and leaves. It has a strong fragrance which it gives out at night when it is in full bloom. This is to attract pollinating animals that are active at night. One flower blooms on three consecutive nights to increase the probability of pollination, after which it withers away. The moonlight reflects off the white and yellow petals to make the flower gleam in the night. Additionally known as Eurasian Catchfly have a yellowish white flower that can grow upto 1.5–2.5 cm with 5 petals and 2-lobed. They mostly thrive in Hillside ridges, dry and sandy meadows. This night blooming flower is well-known and economically valuable for its fragrance from which perfume is derived. It is most commonly white but has many colours including pink, orange, yellow and purple. It has prominent anthers and stigmas to make pollination easier and uses the pleasant fragrance to draw insects and small birds that are the main pollinators of this flower. Many coloured varieties of the Casablanca Lily are frequently planted together in a garden to give a beautiful landscape of colour. The flower looks very similar to the shape of a trumpet with six white petals and you can see tiny dots on each petal at the centerline. Talking about the appearance, from the centre of the flower bright red stamens spring out in a unique colour pattern making it one of the beautiful night blooming flowers. To make a beautiful bouquet, 3 to 4 flowers are enough in any of the occasions. The plant can grow upto 4 feet in height. This flower is typically found in areas with high rainfall and dense vegetation. It grows in clusters with each flower having a light yellow colour and brown streaks on the petals. These flowers usually bloom in spring and summer and the plant has a height of about 45 inches. The word Gladiolus is Latin for sword and the flower is named so because some of its parts like the leaves are poisonous and cause mild irritation to human skin. This poison is present to deter predators from eating the plant. However, the flower has a pleasant smell to attract butterflies and bees to pollinate it. During ancient times, it is known as xiphium that comes from the Greek word xiphos meaning sword. One of the night blooming flowers known to be the birth flower for August and represented Roman Gladiators before the African Gladioli became popular in the West. The Mediterranean and British Gladiolus flowers mostly used in the treatment of physical ailments. Talking about the appearance, the plant can grow with rounded and symmetrical corns enclosed in several layers of brownish, fibrous tunics. The Moonflower is so called because it blooms only in the moonlight and closes when the Sun rises. It is commonly found in North America but in warmer southern regions. It may be pink or white in colour and has a pleasant smell when it blooms in summer and spring. The plant of this flower grows to a height of 15 feet and is best suited to loamy soil. The flower also looks like a full moon when it blooms which may be another reason for its name. Talking about the appearance, the flowers are round in shape like a full moon and hence the name. The flower usually blooms in the evening and Ipomoea species of the plant mostly cultivated as ornamental plants and mostly thrive in colder areas. The Ipomoea species grown for hanging baskets, fences and trellises. You will also like reading about best wedding flowers in the world. There are many species of night-blooming water lilies in the world and are broadly categorised into tropical and hardy. The tropical lilies are larger and have brighter colours. The commonly found colours include purple, pink, red, yellow and blue. These flowers bloom late in the evening and close up in the morning. One flower can bloom several times before wilting. Some tropical lilies can be very large – up to 12 feet in diameter and give out a light pungent smell to attract pollinating animals and birds. It is also considered as one of the most beautiful night blooming flowers. The leaves or pads of the plant floats on the surface of the water and attached at the bottom of the pond by a long stem. They love to thrive in fresh water which is shallow and still mostly around the edges of lakes or in small ponds. This flower is known to bloom at night and close up early in the morning. During its boom, it gives out a strong fragrance to attract nocturnal insects and moths to pollinate it. This plant is native to North America but has been transported to Asia, Europe and Australia for its aesthetic value and now is fairly common all over the world. Most parts of this plant including leaves, seeds, flowers and roots have medicinal properties and are edible. The plant of the Evening Primrose grows between 3 and 5 feet tall and flowers in July and August, although the time differs according to the species of the plant. It is also considered as one of the most beautiful night blooming flowers. The flower mostly blooms during spring and summer. It opens up late in the afternoon and closes at the sunlight and hence known as “evening primrose”. They have a strong fragrance that attracts moths which pollinates this plant. The fruit of the plant is filled with elongated seed. Fruit ripens late in the summer and during the fall. According to a few studies, evening primrose can produce 150.000 seed per season and it mostly propagates via seeds. The seeds of the plants are also a source food for the wild birds, however, Evening primrose can be used in the human diet. Roots can be consumed as root vegetables and young leaves as leafy vegetables. It is a biennial plant means it will complete its life cycle in 2 years. Like Wordsworth’s daffodils on a bright sunny day, we are sure after reading this list of the most beautiful night blooming flowers, you will not forget to think of these tiny wonders around you the next time you leave for a late-night stroll.